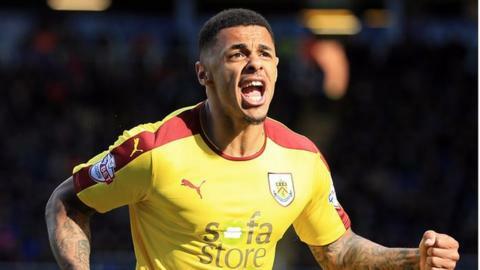 Burnley striker Andre Gray has been named Championship Player of the Year at The Football League Awards. The 24-year-old, who moved to Turf Moor from Brentford in August 2015 for £6m, has scored 24 goals in 39 league games this season. Gillingham midfielder Bradley Dack, 22, and Oxford United's Kemar Roofe, 23, won the respective League One and League Two awards in Manchester. Leeds midfielder Lewis Cook, 19, was voted Young Player of the Year. Sheffield Wednesday forward Marco Matias won the prize for goal of the year for his strike against Leeds United. Twenty-two of Gray's goals this season have come for the Clarets, the latest being the winner at Birmingham on Saturday to move his side up to second in the Championship. Gray beat Brentford's Alan Judge and Fulham's Ross McCormack to claim the award after a vote by club managers. "I'm learning every day but I have got more to learn and hopefully I can continue to do so," said Gray. "I've probably exceeded a few people's expectations but the expectation that I have now is to help Burnley get promoted." Former Chesterfield, Southampton, Blackburn, Bolton and Preston striker Kevin Davies picked up the Sir Tom Finney Award. The honour, named after ex-England and Preston forward Finney, is given by the Football League 'to a player who has had an outstanding career in its competitions'.